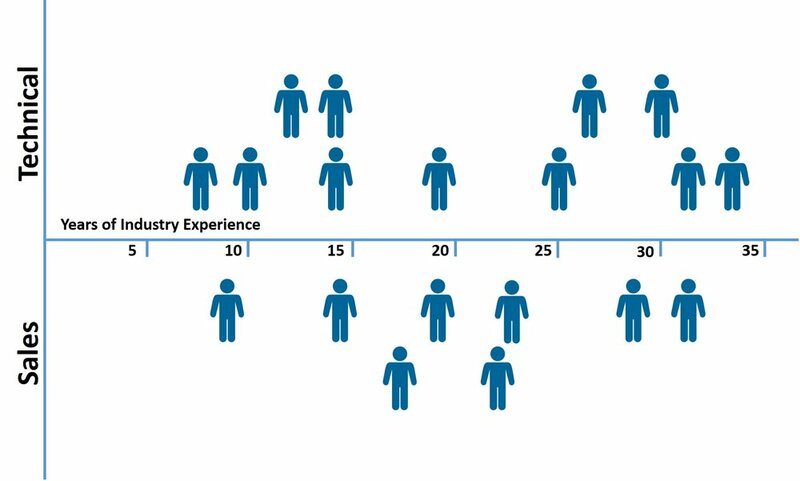 This chart shows the average experience of ClarkPowell's engineering and sales teams is over twenty-one years. Our sales, engineering and technical services staff average over twenty-one years in the industry; the vast majority of that time with ClarkPowell. ClarkPowell is a full-service Audiovisual (ProAV) provider. We can help with Design, Engineering, Installation, and Maintenance Services for Audiovisual, Video Conference, Projection Systems & Video Communication Systems to Corporate, Education, Medical Simulations, Government and House of Worship. We have extensive experience in Corporate Boardroom AV, Presentation System and Training Room solutions, as well as Audio and Video Conferencing / Telepresence Spaces. ClarkPowell is experienced in Engineering & Creating Collaborative Meeting Spaces, Emergency Operations Center Displays, Council Chamber Rooms and Impactful Digital Signage Messaging systems as well. Distance Learning for a complete Digital Classroom experience! We serve the all of North Carolina and South Carolina with offices in Winston-Salem, Charlotte, Raleigh, Columbia and offer full-service in Charleston. ClarkPowell has partnered with us to ensure all our needs and expectations are met. They have provided professional installation, and are responsive should problems arise. Our long relationship with ClarkPowell and their great people make our mission possible. Training tomorrow’s broadcast professionals while keeping the local area informed. Your Project Manager is always one step ahead providing me with the information I need before I have an opportunity to ask for it and your field techs always keep me up to date of the job status. Our ClarkPowell contact is OUTSTANDING, very knowledgeable, smart and adds a great element to our meetings and helping others think about the space and use of technology differently; for the better. Your team was great during a recent project. There were some challenges but your Project Manager made it all come together. His attitude was always great and I really appreciated all his help! Our approach to designing your system starts with a detailed analysis of your intended use for each space. This approach has served our clients well for over 30 years and is one of the key reasons they choose to maintain long-term relationships with ClarkPowell. Consultative meeting with clients to customize the AV design to their specific needs. ClarkPowell's experienced sales staff and design team work with you to determine the right system solutions for your needs. ClarkPowell provides complete consulting services including specification packages, bidding document templates and project management. Project Managers and Lead Installers regularly meet to review details of the installation project ensuring the it is done right and on time. Our system designers, project managers and experienced installation teams ensure your project is completed on time and fully functioning without disturbing your normal business flow. Your complete satisfaction is our goal and our promise. A lighter moment in the early days of ClarkPowell... Apparently it was "Plaid day". ClarkPowell was founded by Read Clark, Don Norwood and David Powell in 1983 when a need was seen for a company that would offer exceptional service and superior value to A/V professionals throughout the Carolinas. We pride ourselves on our professionalism, knowledge and ability to help our clients get the systems and functionality that they need. With a Marine Corps background and a dedication to hard work, Read Clark was an excellent leader who took great pride in the company and all of his employees. The culture of "ClarkPowell Family" is a cornerstone of our success and remains solidly in place today. An employee of ClarkPowell almost since the beginning, Read’s daughter Stephanie (Clark) Bluhm took over the presidency in 2010. Stephanie led with wisdom, sensibility and a dedication to the success of ClarkPowell. Susan (Clark) Pinch became president following Stephanie’s unexpected passing in February of 2016. Susan has been with ClarkPowell since 1995 and is looking forward to a bright future for the company.